GReddy Oil Filter Relocation Kits - Lesher Motorsports, Inc. This kit allows you to relocate the factory oil filter for easy maintenance with a sporty look. 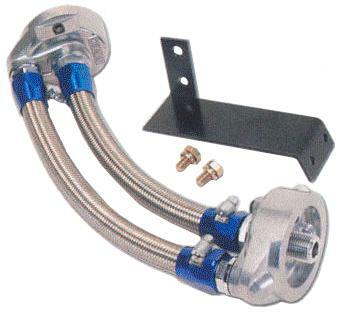 Billet adapters allow for easy installation of gauge sensors, such as oil pressure and oil temperature. Also included are brackets, Earl’s fittings and perform-O-flex hoses (use of of GReddy QX-01, QX-03, SX-01, SX-03 or 1985-87 Toyota Corolla GTS Oil filter required).